"As luck would have it today's challenge falls on St. Patrick's Day! Ah, the luck of the Irish, or so some say. For this weeks challenge make a card or tag with some sort of bingo card on it, and use the color green somewhere on the project. With some luck, you just might have the winning one!" After I had the bingo card, I was having a case of the hiccups trying to put it all together. I aspire to be one of those folks that can create "shabby-tastic" masterpieces. Admittedly, I struggle with that style...probably because it is out of my usual comfort zone. But that is what makes a challenge challenging, right? I had some wonderful encouragement from my friend LeAnne, who wisely suggested that I use one of the bingo numbers to celebrate a date. Bazinga! There it was! (Thanks, LeAnne!) I happened to need a card to send to some friends of ours who are celebrating 15 wonderful years of wedded bliss, this year. There are a lot of elements on the card, so I am just going to hit a few points. I colored the satin flowers with markers to match the card colors. I printed out an extra bingo card so I could cut out another rose to pop-up and glitter...I also punched out the "15" and popped it up on a heart for the love-birds. The scrunchy seam binding and crochet heart came from the amazingly talented Linda Coughlin, our fearless leader at Our Creative Corner. This is not my usual style but I really, REALLY enjoyed stepping out of my usual "crafty safe-zone" to make it. All of the supplies are listed at the end of the post. Here is the inside of my card, perfect for the happy couple. Isn't that sentiment wonderful? This could also easily be used for a wedding card. Beautiful creation. Love the pink roses and the whole design. As soon as I saw this colour Palette, I fell in love with it, like you, I struggled with the Bingo Card, but you have excelled in the Challenge, so well done my friend. I love all your little elements that you have added, it is a great card. This is gorgeous and SO romantic! I love the texture of the embossing and the softness of the seam binding and the lave heart. Simply stunning! It's great to be back at the OCC, I'm eager to be craftin' with you again! Oooooh.....aaaaah.....wooooow.....!! This is yummy, Anne Marie! The colors you used are just delicious! You rocked this style! All your sweet embellishments are just perfect! Not too much, not too sparse, just right! LOVE it! This is gorgeous! 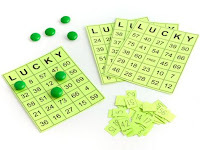 I have never used Bingo cards because I don't know what to do with them......you sure do! love it! Outstanding work Anne Marie!!! You knocked this out of the park! I am so proud of you! Anne Marie, I think you did a fabulous job with your bingo card. I love how you printed an extra card, so you could cut out the extra pieces to make them pop! and they do! 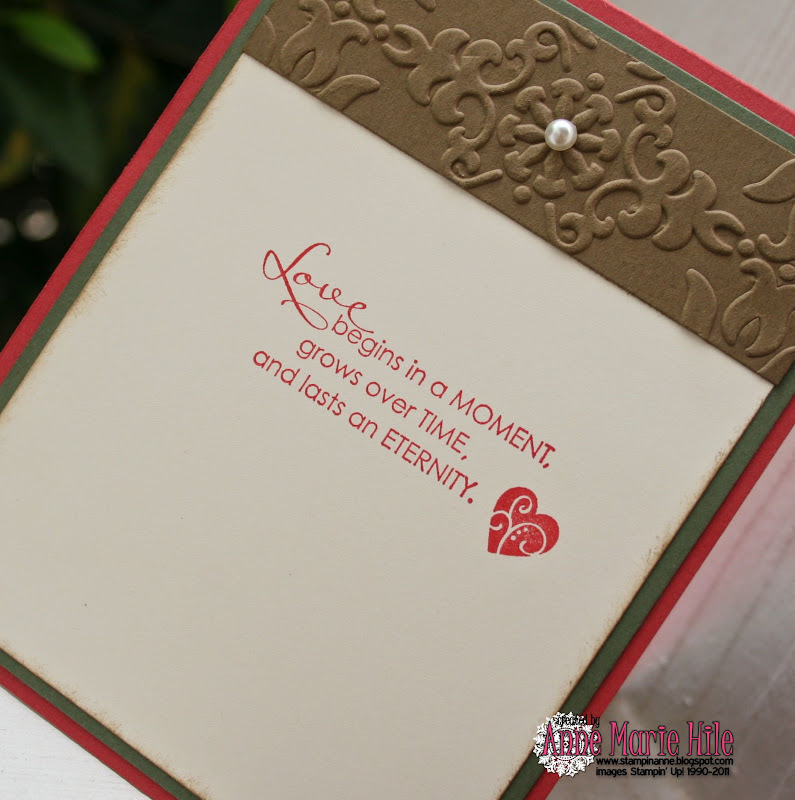 I hope your friend loves this wonderfully beautiful card! I know that I would! 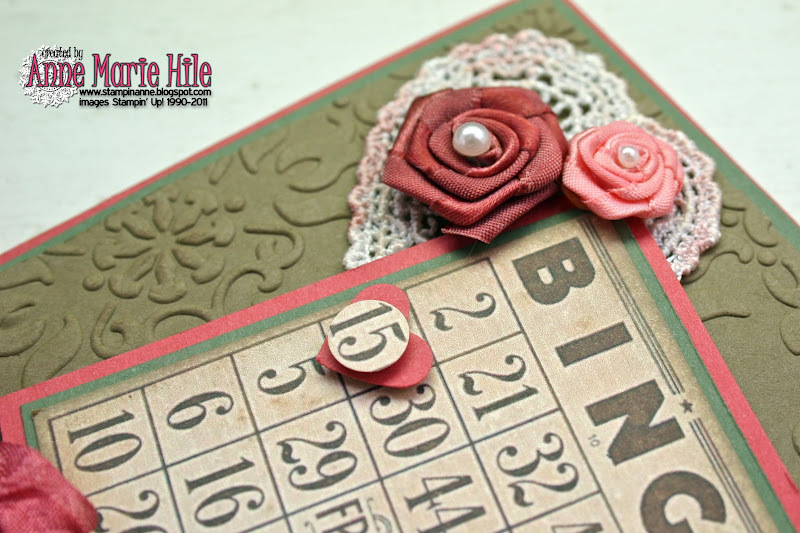 have a great weekend, hugs, sharon w.
Only you could make a bingo card look pretty in pink! A gorgeous vintage card using the bingo card! Super creative idea to use a heart and the number fifteen to celebrate their number of years together! Love this card...great job!!! Stunningly gorgeous card! The doily, rosettes, and ribbon are beautiful. The inside is so pretty as well. WOW!!!! Gorgeous! Love this so much! Love, love, love this card! I have some bingo digis that are still sitting in my file because I didn't have the first clue what to do with them! This is such an awesomely shabby-vintage card! So many things to love!! Still laughing at 'Bazinga' and thinking about how Sheldon would critique your creation. Oh my! This is absolutely my most favourite card of all the cards you have ever made and really, I love them all but this one is unbelievable!!!! I never even thought of using a bingo card! Who knew???!!!! You are opening up my eyes to new possibilities my friend! Your card is shabby-tastic. 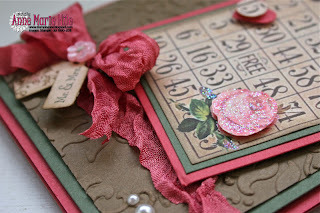 I love the color combo and your unique take of combining BINGO with an anniversary sentiment...GENIUS! TFS your creativity. Woohoo, Anne Marie! You simply outdid yourself with this gorgeous lil honey! I fell in love with it on first sight. 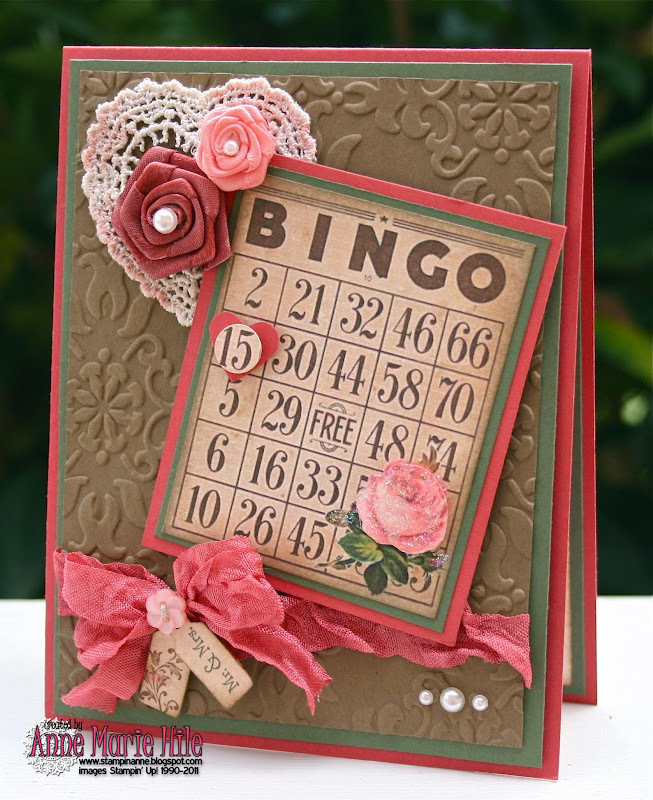 The colors are just so pleasing to me and that BINGO card is vintage perfection. Love the way you highlighted the 15th for the anniversary - very clever idea. And that sweet Venice lace heart - wow, what a perfect way to use it. I always love seeing how people use the items from my shop. You totally ROCKED the BINGO challenge! This is just so wonderful!!!!!!! I love the use of the bingo card. My friend made one for me using the "15" too for our anniversary date!!! Super stunning .... love everything about this lil beauty, you stepped out and you have shone ... well done!!! Loving all the elements here, the flowers, the gorgeous crochet heart, the ribbon, the tags ... wow!!! I LOVE this Anne Marie, just so perfect in every way!! !